" Lisa is a lovely, genuine person with a true passion for dogs"
We're so pleased to have discovered Lisa and the Mountsorrel Groom Room.. Our two Miniature Schnauzers have just had their fifth visit and they absolutely love it! They arrive looking a bit shaggy and come out looking beautiful and smelling fabulous. They are so pleased to see Lisa, who lavishes lots of love and attention on them, and they absolutely love the spa bath and massage which they find very relaxing. Lisa is a lovely, genuine person with a true passion for dogs and great service. Many thanks, Lisa.. Henry and Holly are already looking forward to their next visit. "Lisa Goes That Extra Mile"
"Definitely a First Class Groomer"
Lisa is a fantastic groomer. Lisa has been groomer 2 King Charles Cavaliers for sometime and she gives them so much love and attention whilst performing an excellent job. I would most certainly recommend Lisa to anyone who wants their dog/s grooming - definitely a first class groomer. 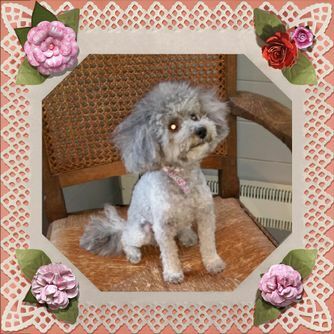 "Gives Us Lots of Helpful Advice"
Lisa is a fabulous groomer she has helped so much with my rescue poodle! She had never been groomed before and her coat was in a really bad state to begin with. Lisa has helped build her confidence being groomed ,she's so patient and kind and gives us lots of helpful advice ! my dogs coat is so much better now and she's so confident going to Lisa for regular grooms ! Highly recommend ! "She Truly is a Lovely Person"
Would recommend Lisa to anyone & everyone, she truly is a lovely person who spends time making sure our dogs are happy as well as grooming them. Particularly impressed as we have quite a temperamental chihuahua & he couldn't enjoy it more which we didn't expect to ever find. Especially love the photo collages we receive after each time our dogs visit, it's a lovely, much appreciated finishing touch! Contact me today, in Loughborough, Leicestershire, to schedule the services of a professional dog groomer.